To reinforce a wooden door frame fitted with a surface mounted rim lock or nightlatch. Traditional wooden door frames will splinter and split open during a forced attack. A burglary victim, following a 'kick in' attack, would often find that the door frame and rim lock security had not been able to resist the attack and had failed. 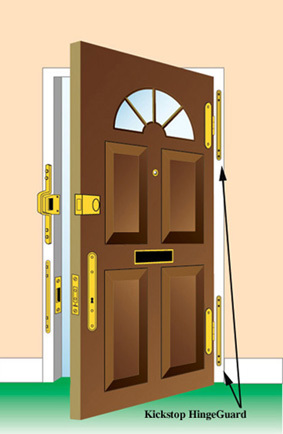 To counter this problem, the police and other crime prevention specialists very highly recommend the London Bar to strengthen and reinforce the door frame and fit over the rim lock or cylinder nightlatch. It is easy to fit, is used with existing locks and provides extremely effective additional security every time the door is closed and locked. packet of 2 1/2" long, No. 10 hardened steel woodscrews is supplied. The Kickstop London Bar is a door frame reinforcing solid steel bar with a 'D' shaped staple to fit over the staple (keep) of a surface fitted rim lock or cylinder nightlatch. 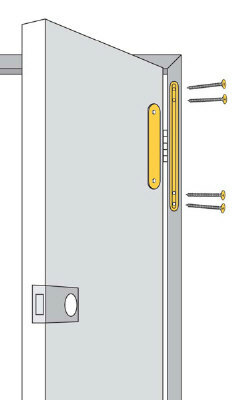 This very effective steel anti-burglary device is screwed on to the internal face of the lock side of the frame and will resist the kicking, splitting and forcing open of the door5mm thick solid steel bar with a rounded edge and countersunk holes24" (610mm), 72" (1830mm) or 78" (1980mm) long5/8" (16mm) or 3/4" (20mm) wideStandard (30x70mm) , Large (30x97mm), Extra Large (40x105mm), Universal (30x70-97mm) or Ingersoll SC71 (modified 30x70mm) staple sizeNB: The staple of the London Bar (the 'D' shaped part) is available in three main sizes. Standard, Large and Extra Large. The purchaser must be aware that there are 100's of rim lock and nightlatch staple shapes and sizes in use in and the London Bar Staple is only designed to fit over the lock staple and is not designed to provide a contour hugging tight fit.NB: The London Bar staple has to fit OVER the surface mounted rim lock staple (keep) - the part of the rim lock that is screwed onto the frame. Take correct measurements in order to choose the appropriate London Bar staple size and avoid one that is too small.The Universal size staple is designed for customers who are not sure whether to purchase a Standard or Large size. A traditional Style Standard Yale 77 Nightlatch is shown for illustration purposes only The Staple (or the keep) is the metal part of the rim lock or nightlatch that is screwed onto the door frame 9612 & 9613 Ingersoll StapleThis is a 'handed' 30mm x 70mm London Bar staple used with the Ingersoll SC71 rim lock.It will fit over the lock staple and has a small cut out section to allow the springbolt of the lock to pass through.The product code 9612 is for a 'left handed' fitting and the 9613 is for a 'right handed' fitting.NB: From inside the property on an inward opening door - a 'right hand fitting' is where the lock is fitted on the left hand side. The door would then be unlocked and opened inwards - using the right hand. An Ingersoll SC71 Nightlatch is shown for illustration purposes only NB: Rim locks and nightlatches are fitted at slightly different heights on individual doors. When fitting the 72" and 78" length London Bars, a little of the top or the bottom of the London Bar will probably need to be removed when fitting. The surplus can be cut off with a hacksaw.The 'D' shaped bend in the two longer London Bars is positioned at the approximate height of where most surface mounted nightlatches should normally be fitted.The 72" bar is approximately 6" shorter than the height of a door frame - to help avoid the need to hacksaw off a piece of the bar if Tower bolts, other sliding bolts or fittings are fitted at top or bottom.